Kelowna 2 pm pickup from airport or hotel. Ends in Calgary at 2 pm on day 8, drop off at Calgarty Airport, bus station or any hotel. ✔ All Departures Are Guaranteed! Step into a winter world of mountains as far as the eye can see, towering spruce trees buried under a heavy blanket of snow, and everything silent as the falling snow muffles all sound. As your tips dig through the snow you throw a big turn between two trees, coming to a stop and catching your breath. In the distance you hear the delighted yelp of another skier, and then your buddy pulls up next to you, gasping for air and grinning from ear to ear. 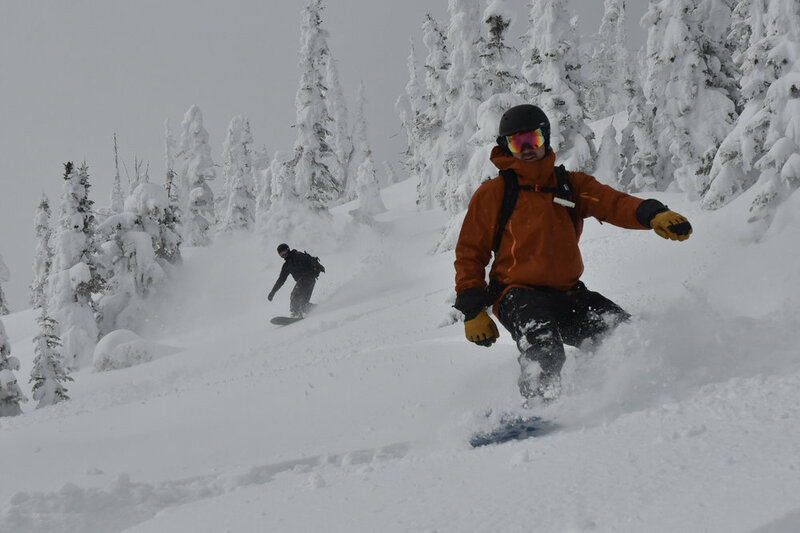 This is winter in the Kootenays, and this guided ski/ snowbaord tour is your chance to live every snow lover’s dream. 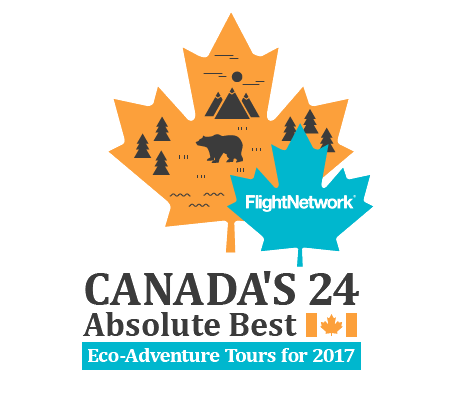 Welcome aboard your trip of a lifetime, where you will spend eight days exploring deep into the mountains of British Columbia. This is the home of Red Mountain, Whitewater and Fernie Alpine Resort and with the help of your local guide you are in for the behind the scenes tour. Our guided tour means that you will be skiing with a genuine local who has spent year after year exploring and finding the local gems. You will have VIP access to the best runs and secret stashes on each mountain, but not just that. With our expertise you will have the opportunity to soak in a hot springs cave, and dine at the best restaurants in each town. We have taken years to perfect this itinerary, so you can rest knowing that everything is taken care of, with minimal driving time and maximal fun! This tour is suitable for anyone looking for more than the ordinary ski vacation. If you see yourself being immersed in the adventure of a lifetime, making new friends, mingling with locals, and getting deeper into the mountains than you thought possible than you have found your dream trip. With a single email we can take care of everything so all you have to do is 10,000 squats (just kidding but seriously!) and come ready for a good time. The mountains have terrain for everyone so this tour is suitable for all levels of skiers and boarders. We can arrange lessons, rentals, snowshoeing, cat or heli skiing, or perhaps a spa day during your ski tour. If you love winter and you love to explore, this may be the ultimate trip for you. We look forward to making sure this is the trip of a lifetime for you! 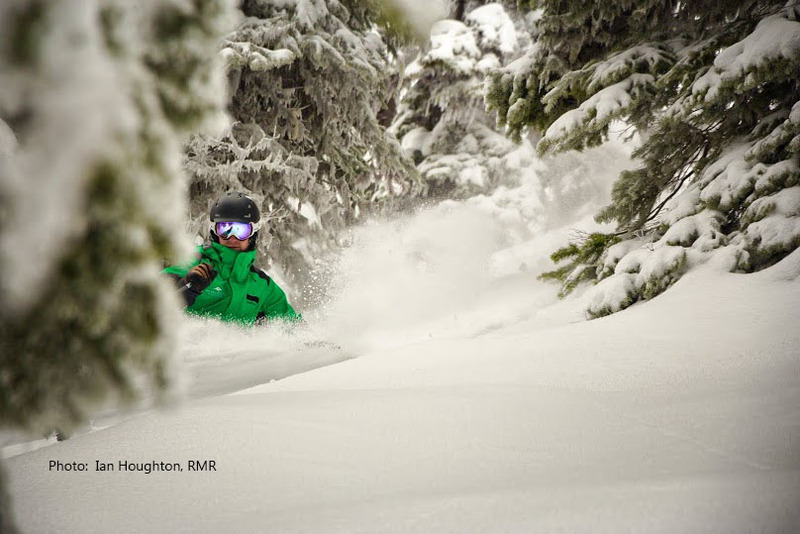 Day 1- Pick up in Kelowna at 2 pm from Kelowna airport or any hotel before meeting your new ski buddies and heading deep into the heart of the Kootenays for your week of skiing and boarding far off the beaten path. Enjoy the scenic drive from the Okanagan Valley (BC's desert valley) to the Kootenays (Canada's secret mountain playground), winding through mountain passes plus a quick stop at Deadwood Junction (home of the best cinnamon bun and quirkiest cafe owners in Western Canada). Get checked into your hotel and then head out for a delicious meal in the vibrant mountain town of Rossland. Day 2- Enjoy a hearty breakfast and coffee before hitting the slopes of Red Mountain with your guides where you are able to start exploring 3500 acres of inbounds terrain, along with several hidden warming huts. Red Mountain is renown for the 360 degrees of skiing off the peak, glades, steeps and anything else you can imagine packed onto 3 mountains. Rossland is probably the quirkiest town in the Kootenays so you are up for a good show between the luge team and the locals getting things fired up at Rafters Bar during your après ski session. Take some time to soak in the hot tub before heading out on the town for some beer tasting at the brewery and amazing food at the best restaurant in town. Day 3- Head up to Red Mountain with your guide to try and put your mark on the remaining 3500 acres. Go for a cruise and enjoy some quiet time by the wood stove at Paradise Lodge or follow your guide for some thigh tearing laps down the Slides, or finding secret lines through the back bowls where the snow is best and the crowds often miss. Scarf down a hearty lunch on the patio of Paradise Lodge before ripping up some more terrain and then head over to Nelson for a soak and well deserved dinner at a favourite local restaurant. Day 4- Hit the most popular cafe in town on your way to Whitewater Ski Resort, where you can ski lap after lap of blissful, dreamy terrain without the crowds. 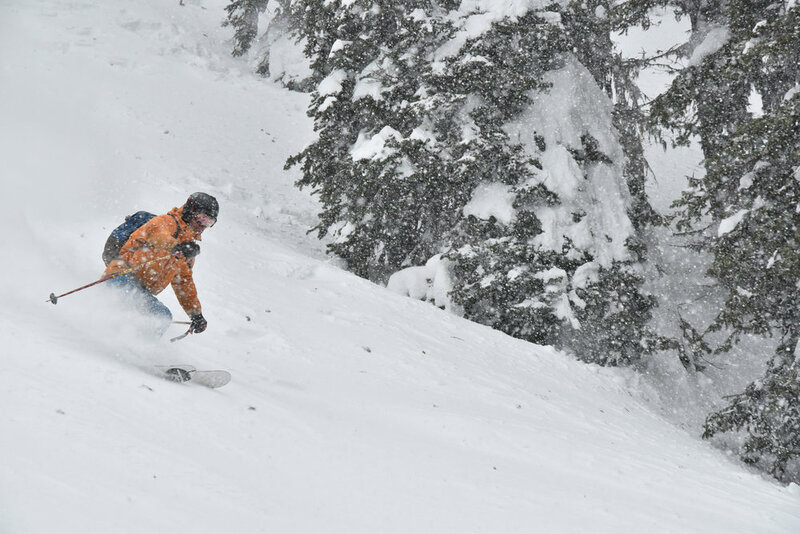 Whitewater is home to one of the biggest snowfalls in western Canada and also home to the smallest lift lines. Seriously, most days you finish your run and glide onto the chairlift without slowing down, and during the busiest days you wait for 5 minutes in the lift line. The snow remains fresh for weeks after a snowfall and we can show you the most untracked places on the entire mountain. Day 5- Spend another day in a snowy paradise, exploring the seemingly endless tree runs at Whitewater Ski Resort. Your guide will take you to the local stashes which means you get a first class ticket to the best powder on the mountain. The tree runs here have an amazingly diverse feel with some steep zones and tons of fast, mellow areas that are wide open. At Whitewater the trees swallow all the noise and when you stop the only thing you hear is your heartbeat. It's surprisingly nice to see another skier glide between two trees in the distance before you are immersed in complete solitude and powder again. Tonight we go for a soak at a set of hot springs near town and you can wade into a steamy cave filled with hot therapeutic water to help your legs recover. Day 6- Today we hit the road and head over to Fernie Alpine Resort, where you get to explore yet another one of Canada's best mountains with your guide. 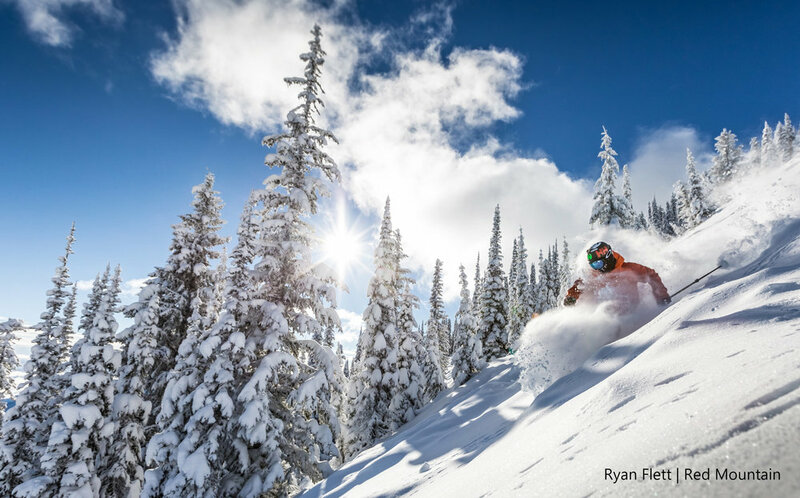 Fernie is known for having one of the highest annual snowfalls in Canada, which coats 5 bowls and 1 epic peak in a thick, fluffy layer of snow. With the help of your guide you are going to explore the entire mountain in style. After some après ski at the base of the mountain we head over to your hotel and get checked in, and then go out on the town for some gourmet food. Day 7- Today is your last day to leave it all on the mountain while we explore the runs that you didn't make it to yesterday. With more alpine bowls and tree runs than you could possibly ski in an entire vacation we will have our work cut out for us. Break for lunch at the top of the mountain with world class views of the Lizard Range in all directions. At the end of the day raise your glass for a cheers with the group, celebrating the amazing week you all shared and the friendships you have made. Day 8- Today we hit the road again, heading for Calgary. Enjoy the last bit of mountain scenery, as we wind through deep mountain valleys and pass through old mining towns. We aim to drop you off in Calgary by 2 pm, and can drop you off at any hotel in town, or the airport. You should be safe to book any flight after 4 pm. Guided ski/ snowboard trip on the Powder Highway. Small groups, hot springs and three mountain towns. Revelstoke, Kicking Horse, Whitewater. Guided skiing/ snowboarding in the Canadian Rockies and Powder Highway. 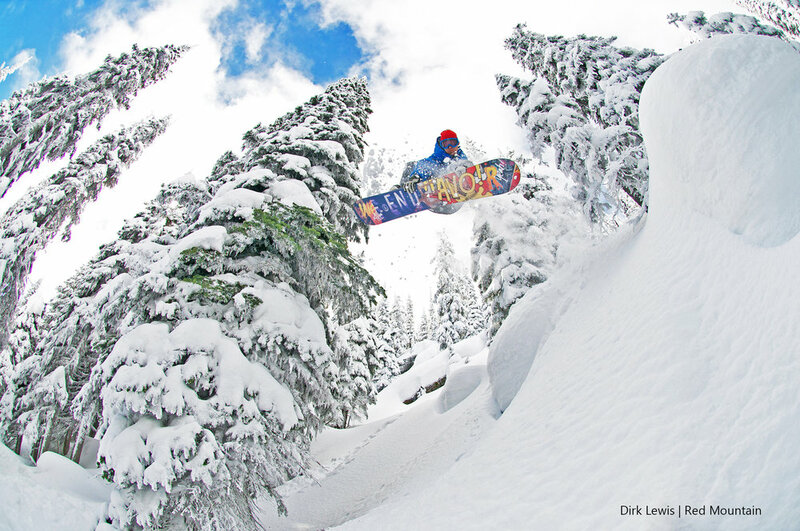 Explore Sunshine, Lake Louise, Kicking Horse and Revelstoke. Guided small group ski safari visiting three mountain towns with two hot springs. Explore Revelstoke and Kicking Horse.